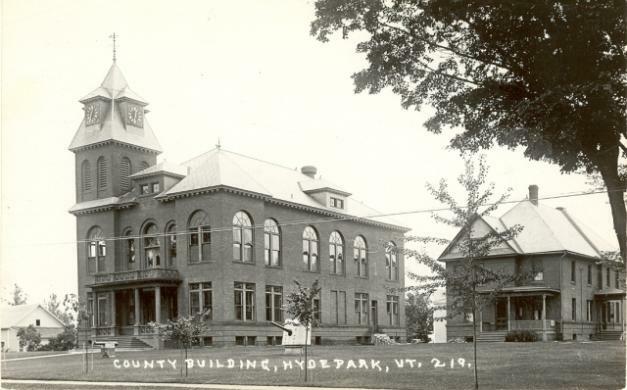 The historic Lamoille County Courthouse was built in the early 1900’s and is the centerpiece of the Village of Hyde Park. The Courthouse is on the Vermont and National Historic Registers. By 2012, the building was inadequate to meet the needs of the community. SAS Architects were hired to expand and renovate the Courthouse and improve accessibility. After study, they recommended two additions that were harmonious with the character and scale of the historic building. The additions contain a second courtroom, administrative space, a detention facility with Sallyport, Judges’ Suite and facilities for jury deliberation. Take a look at the new addition and renovation! Marvelous addition with the most incredible brick work. All lines match, brick mortar perfect, and you have to blink three times to figure out which part is new and which is historic. 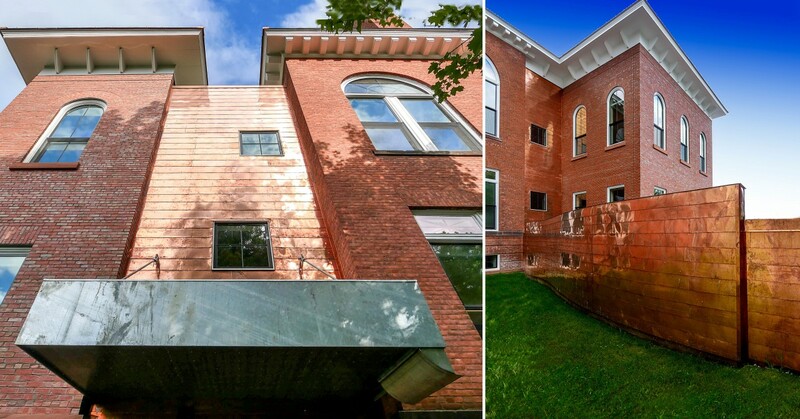 SAS Architects has “wrapped” the line between the old and the new with copper, indented from the exterior surface. Intriguing to see, as sometimes it “hides.” Added spots of copper make it even better. Try to find all of them: In the roof, the edge of a lower roof, front face on the tippy top alcove, on an awesome winding wall that goes between the building and the sherif’s building, and hides the low roofed structure in the back. The early settlers were obliged to raise their flax and manufacture their own wearing apparel, for it must be remembered it then required sixty-four bushels of barley to buy one yard of broadcloth, and one bushel of wheat to purchase a yard of calico. The first general business and article of commerce was potash or salts of lye, which was manufactured in every town. Following this, as grain became more abundant, was the manufacture of distilled liquors. This business was carried on quite extensively, there being at one time ten distilleries in the town of Cambridge alone. The great mart for this article was at Montreal. Next came the hemp trade. A large manufactory for dressing the hemp for market was erected in Waterville; but this soon died out and the factory was converted into a woolen-mill. The manufacture of starch has also been conducted quite extensively, and is carried on to a considerable degree at the present time. All through this period, however, as is common in all timbered districts, the manufacturing of lumber has received great attention. The principal manufacturing interests of today are lumber, in its various branches, starch, woolen goods, butter, cheese, etc., all of which will be found noted in connection with the sketches of the several towns wherein they are conducted. Smith-Alvarez-Sienkiewycz, Architects was formed in 1993 by Bren Alvarez, Marty Sienkiewycz, and Stephen Smith. Located in the heart of Downtown Burlington, they have a staff of ten people, including eight registered architects, one architectural intern and an office manager. They are an accomplished and award-winning local firm with the proven capability to undertake complex projects with a wide range of type, size, and scope. Their business approach is straightforward; they seek to provide excellent architectural design and service to a select group of clients. The firm is a leader in the design of sustainable buildings in Vermont. They designed ECHO, an integrated center dedicated to the ecology, culture and history of the Lake Champlain basin. This was the first building in Vermont to receive LEED certification. This building received an Award for Excellence in Design by the AIA and the 2003 Pasackow Award for Extraordinary Architectural Integrity. Their design for Franklin Environmental Center at Middlebury College was awarded LEED Platinum, the first in Vermont to receive this certification, and only the 7th in the country. The Mill Complex at the Marsh-Billings-Rockefeller National Historic Park, also an SAS design, was awarded the second LEED Platinum rating in the State. Their ongoing work at Shelburne Farms combines the preservation of an extraordinary resource, the only National Landmark site in Vermont, with ambitious environmental goals. With the proposed Learning Center, in particular, they charted new territory with the integration of sustainable principles with a truly historic building and landscape. The design for this project won a 2007 AIA Excellence in Design Award. Their work at the Farm is ongoing and has touched most of the buildings in this historic treasure. Projects on the Farm typically involve restoration with adaptive reuse and, when appropriate, application of sustainable systems and technology. Their belief in sustainable technologies is supported by their experience and willingness to thoroughly research available material and methods. They are fluent in evolving technology, and the firm's longevity has yielded an expertise in local construction and permitting issues. Lastly, they all share a desire for excellence and attention to detail, which they believe is evident in our work.